Seeing as it is my birthday tomorrow, I decided to get myself a little gift. Not really…well yeah almost! A couple of weeks ago, during Amazon Prime week, at the office some of us were going through the various offers that were available at that time. 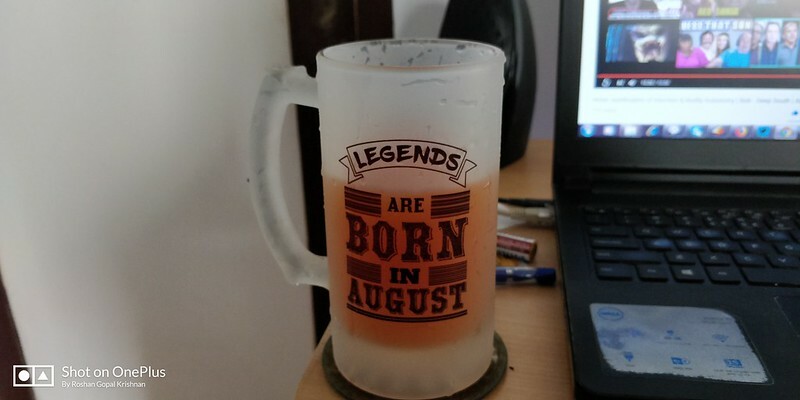 A couple of us bought a few items and I was looking at a few things – new laptop bag, some granola bars and then I decided to check out beer mugs. I found a few that I liked and put them in my wishlist. I looked at this one, pictured here and thought that it would be great to have one for a lark and buy it as a present for my birthday. 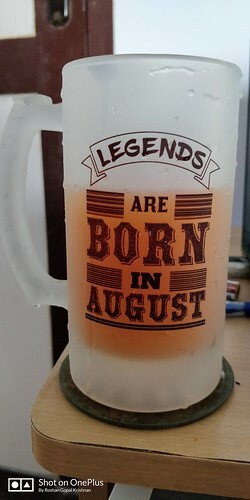 However, a few days later when I checked the “Legends are born in August” one was out of stock while they had some in stock for some of the other months. I kept checking every day and it was still out of stock. On Wednesday last week I message the seller, YuBingo, to see if they could get one for me and about 6 hours later I get an alert on my Amazon app stating that the August one was back in stock. I immediately placed and order for the phone and it showed that it would reach me today, August 1st. Great! Well it actually reached me yesterday, July 31st and I happily opened the box and shot a quick video of it. No beer in the house so I made due with some mixed fruit juice a la Tropicana. It’s pretty nifty to have a frosted mug in the house. This weekend I will get some beer and enjoy a couple using my new mug. Enjoy the pictures and here is the unboxing video, down below. Cheers! If bill consolidation loans bad credit you could only eat one thing for breakfast for the rest of your life, what would you choose? I can make eggs in scrambled, poached, cash loans unemployed fried, sunny side up, hard boiled, soft boiled and omelet style. That’s a lot of variations and I’m pretty sure there’s more but I don’t know how to do it. Eggs have plenty of variety in the way that you can make them. And that’s my comercial loan choice. Up to payday loans guarenteed 70% off on all women leather jackets.